Vladimir Nabokov once described the thriller as a “fond tradition” in which “the villain is generally punished, and the strong silent man wins the weak babbling girl.” We all know the kind of novel he means. The weary, handsome detective, the woman in distress, the discovery of a body, the labyrinthine quest for the truth, the inexorable triumph of good over evil—these are the sturdy conventions that make the thriller a dependable pleasure. The sentences must move and give action, shepherding the reader from beginning to end, but they need not thrill in their own right. Plot is paramount. Style is secondary, if it matters at all. Canadian writer Elisabeth de Mariaffi, whose books do not skimp on style, has made a young career of breaking from this tradition. Her debut novel from 2015, The Devil You Know, is narrated in the bored, hard-boiled voice of Evie Jones, a Toronto reporter investigating a series of cold cases involving “little dead girls.” Speaking directly and matter-of-factly, Evie reminds readers about the monstrous vulnerability of women to violent crime and the indifference of a world polluted by misogyny. There are no strong, silent men to set the moral universe in order. There are only girls who survive the cruelty enacted on them by men, and girls who die in particularly gruesome ways—strangled and stuffed into refrigerators, chopped into pieces and encased in blocks of cement. Hysteria, de Mariaffi’s new novel, set in rural New York in 1956, is a domestic thriller about a woman and her former psychiatrist, now her dominating husband. It, too, is an exploration of misogyny but in a minor key; a quiet sneer, a contemptuous comment, a hand laid on an arm in controlled anger—these are the kinds of chilly, disquieting actions that prompt de Mariaffi’s characters to wonder: Is he bad or am I crazy? Despite the subtlety of its subject, Hysteria is more ambitious than The Devil You Know, a better novel in design and execution and more ambitious in its feminist commitments. The Devil You Know taught women how to get away; Hysteria teaches them how to fight back. Their son, Daniel, is his mother’s shadow, his father’s burden. He is rarely seen or spoken to by anyone other than Heike, who loves her son with a ferocity born of an inexplicably intense fear. Mothers are often anxious creatures; the very fact of a child, especially a young one, can seem like a tenuous, improbable reality. But Heike’s concern for Daniel overwhelms her character. She sleeps curled around him; other times, she touches her stomach as if to reassure herself that he was once in there. There is nothing surprising about his disappearance halfway through the novel. His existence seems imperilled from the start. This is Hysteria’s general scene and subject, but the sharp and extraordinary quality of the novel comes from its taut pacing, precise detail, hallucinatory narration, and the metaphysical guessing game the reader is enticed into playing once Daniel disappears and Heike sets out to find him. What is real? Who can we trust? Whereas the plot of the conventional thriller follows a trail of clues, each leading the hero closer to a definite answer, Hysteria refuses to settle into the simple arc of a quest. De Mariaffi is more interested in creating an atmosphere, a shared feeling of dread, than she is in solving a riddle, and both her setting and style reflect this. In Hysteria’s best passages, de Mariaffi narrative floats away from her and takes on Heike’s flickering, fragmented consciousness, so we do not know if what brushes against her, what whispers through the leaves, is animal or human, real or imagined. Heike’s slivered thoughts, her half-formed sentences, haunt de Mariaffi’s narrative, until the novel’s mood of enchantment swells into an inescapable dread. Reading Hysteria, one wonders if this is what it feels like to slowly be driven mad. For men like Eric, women are never so much individuals as they are opportunities for disciplined narration. Like the thriller, with its objectifying point of view, the Freudian case history is a genre that makes few concessions to a woman’s side of things. It is, instead, an exercise in creating plot as E. M. Forster defined the term: a sequence of events overshadowed by “a sense of causality”—in this case, the cause of a woman’s psychic distress is whatever a man deems it to be. While the patient’s voice is not literally silenced, it is interrupted, crowded out. She has been, as a critic today might say, mansplained to. Her story’s imperfections and inconsistencies, its plot holes and leaps in logic—the very features that make her real and human— are magnified into a psychological problem for her to overcome. How to battle back? De Mariaffi turns to a genre that Freud believed expressed repressed desires, one that appeared repeatedly in his patients’ dreams and thus offered an implicit challenge to the case history: the fairy tale. Unlike the case history, which takes the disenchantment of women by men as its point of departure, fairy tales belong to the autonomous realm of the imagination. Its structural devices—impossible tasks, magic spells—overrule the case history’s logic of cause and effect, of rational explanation. In de Mariaffi’s thriller, the delicate, uncanny flourishes of the fairy tale take on a barbed edge. The stories Heike tells within the novel offer a model for overturning the plots laid out by men. “You ladies and your tales,” Eric chides Heike, who has a German’s predilection for stories of children delivered to evil by wicked or simply weak-willed parents. If Eric has spent their marriage telling Heike’s story for her, steadying her reality with his words and ideas, Heike must now undo his framing with narrative designs of her own, drawn from fairy tales such as “Cinderella” and “Twelve Dancing Princesses”—these stories bleed into her consciousness, and like the princess who pricks her finger on the spinning wheel, she succumbs to their fantastical scenarios of retribution and revenge. “We Germans really tell the best stories,” she reflects. The plot of “The Bone Flute” mirrors the plot of Hysteria: a child disappears, the heroine seeks out her child—and has her revenge. Just as the raven’s voice guides Gretchen to freedom, Heike’s vivid voice guides Hysteria’s reader through thickets of false memories and illusions, cutting down Eric’s recriminations and false diagnoses. 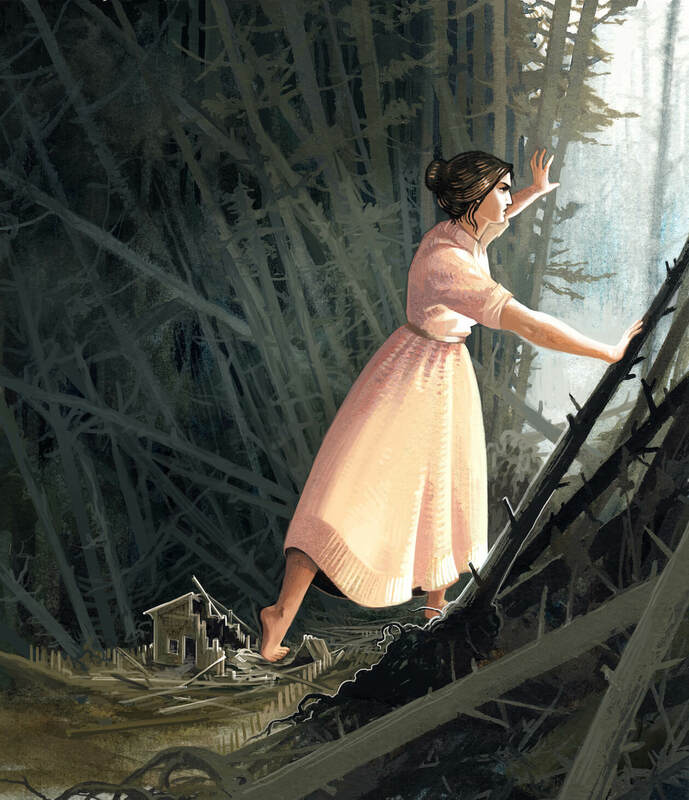 In the dark, untamed, impenetrable forest, anything can happen, no matter how improbable. Good women can triumph over evil men, and tear their bodies to a thousand pieces. Is this a happy ending? Not exactly, even if it is, in its way, a satisfying one. Hysteria is a novel about many things—a mother’s love, the institution of psychiatry. But at heart, it is a novel about the ordinary corruptibility of plot: how certain men wield narrative to manipulate women, to convince them that they are crazy and the world that denies them their happiness is sane. De Mariaffi purges this corruption, turning one genre against another, fighting plot with plot. An act of magical safekeeping, Hysteria imagines a woman’s world as a safer, more just, place. That world is a fairy tale, at least for now. Serena Malyon is a Medicine Hat, Alberta-based illustrator. Her clients include Tor, Orbit Books, and Kids Can Press.